J.M is dead. His sister, Hedda doesn’t believe he could commit suicide. She hires Alisa Sharpe of Grossman Investigations to find out the truth. Tuxedo the Cat helps Alisa find J.M.’s stash of audio tapes. J.M. had loaded them up with book quotes and bible quotes and news stories. Why so many tapes? Where do they lead? In Gunning for the Finish, Kurt Maxxon stumbles on the body of fellow driver Melvyn Hightower. It is clear that Melvyn was showering after practice, but where is the car? It is not in the garage. The focus is on a crazed fan, Melvyn’s wife, and the story of someone whose name no one is familiar with. Enjoy this story of life changing events. Carpentier Falls tells of the murder of one of Kurt Maxxon’s favorite restaurateurs, Carlos Guerrero. His body was found by two homeless boys Kurt met and took under his wing. This book has a surprising end. Look for the second edition of this story soon. Published by IUniverse, You can find this book at Amazon or Barnes and Noble. In Kings Rapids, Rusty Gallagar is found shot to death in his garage. Kurt finds out Rusty was a local gigolo, romancing women who would give him a good time and good gifts. He loved his life, but he found out he had a gentle side. In King’s Rapids, you’ll meet Alisa Sharpe for the first time. A second edition of Kings Rapids will soon be released. 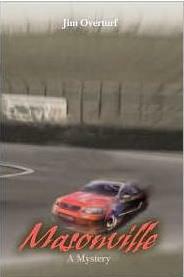 Jim Overturf’s first mystery, Masonville, features a woman who is found dead in a driver’s garage. After a security guard comes forward, fearful because the woman was his boss, Kurt starts looking at all possibilities based upon the description the security guard gives. A growing romance develops for Kurt in Jim Overturf’s debut novel. A second edition of this novel will soon be released.